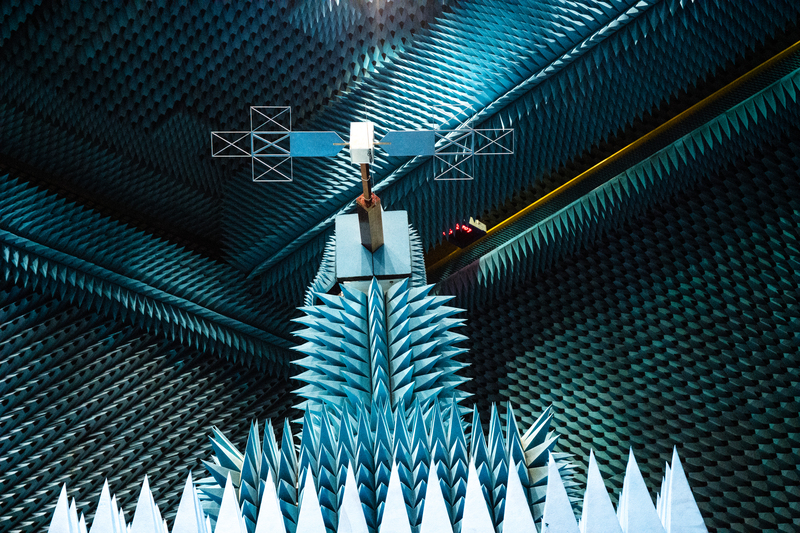 A 1:18 scale model of the JUICE mission's RIME antenna – Radar for Icy Moons Exploration, mounted on top of a simplified spacecraft model during tests in the HERTZ facility at the European Space Research and Technology Centre (ESTEC) in Noordwijk, The Netherlands. RIME is an ice-penetrating radar that will be used to remotely probe the subsurface structure of the large moons of Jupiter. Emitted by a 16-m long dipole antenna, the radar signals will penetrate the icy surfaces of the moons down to a depth of 9 km, providing a vertical resolution between 50 and 140 m.
Testing of a scaled-down model not only meant that the whole spacecraft structure was significantly smaller and the RIME antenna was shrunk to about 80 cm in length, but it also enabled the frequency of operation to be increased to 162 MHz – a much more suitable frequency to test in indoor anechoic chambers.